The most common form of mobility aid for those who need help getting around is a wheelchair. While this may seem pretty straightforward, the options available are bountiful and can be tailored to each individual user dependent upon their mobility limitation or handicap. Longer distances can present a greater challenge to those with limited mobility and due to an injury/illness, or just aging in general, fatigue can be a major problem. Wheelchairs (both manual and powered) and even scooters can make these greater distances much easier to tackle. There are many options available so understanding where a wheelchair or scooter may be utilized is paramount. Many manual wheelchairs are extremely useful indoors on level ground, but over a long haul the user may become fatigued if they operate it by themselves. Statistics from the CDC (Centers for Disease Control and Prevention) show that approximately 17.1 million adults are unable or find it very difficult to walk ¼ of a mile. This translates into approximately 7.1% of our population that needs help to be mobile over a distance and may benefit from a power wheelchair. That number increases to 36.2 million adults who have some form of physical functioning difficulty. This involves approximately 15% of our population. That is a considerable amount of our friends and loved ones who may feel that their quality of life and independence are gone. As we age, this need for assistance increases. The CDC reports that 3.5% of adults between the ages of 65-74 require daily assistance from another person. That number jumps to 10.6% for adults over the age of 75. One report published from the University of California-Disability Statistics Center shows that approximately 6.8 million Americans use assistive devices to aid with mobility. Of that number, 1.7 million are wheelchairs/scooters. This can be for a multitude of reasons including injuries or illness that limit our mobility. Of course in that equation is aging. Every single reason for an assistive device is unique. Many years ago manual wheelchairs were very basic pieces of equipment. Now through the advances of technology and different materials there is a plethora of variations in options to make these devices easily personalized as well as customized. Physical therapists will measure and fit each user properly so the right equipment benefits the user. Wheelchairs vary from basic pieces of equipment with a foam seat and a soft padded back to high tech machines that offer the user an air cushioned seat pad, movable or adjustable leg rests, and the ability to tilt or recline. While manual wheelchairs may be appropriate for light use, powered wheelchairs or scooters can be used by someone who may require a little more substantial transportation in their daily lives. For children that might need assistance, a pediatric wheelchair personifies the saying “the right tool for the right job.” Wheelchairs are not a one-size-fits-all, so why put a smaller child in an adult wheelchair? The same can be said for bariatric patients. The added width and strength of a bariatric wheelchair allows for a better fit and safety for larger patients. By adding accessories such as elevating leg rests or maybe an oxygen tank holder you can customize your wheelchair to whatever overcomes your disability. These can even include trunk support systems to secure the user in place for safety and peace of mind. 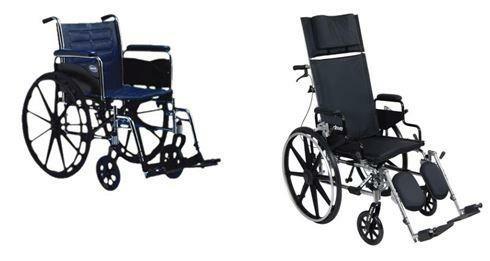 You can customize just about any feature of your wheelchair including headrests, armrests, and even a cup/holder. Make your ride your own!! By regaining your mobility and independence, you can go get a job or catch a ball game or just enjoy the warm sunshine and blooming flowers of spring. Don’t be a prisoner in your own home when just a conversation with your doctor and the fitting with a physical therapist can get you back out there enjoying life again! !